The LA Forum is a non-profit organization that is supported by Sponsors, Members, Interns & Volunteers, and donations to the John Chase Memorial Fund. The LA Forum thanks these Benefactors and Sponsors who have made exemplary gifts that help sustain us as an institution. Join us today and be part of the LA Forum’s important dialogue about architecture, design and Los Angeles. Please see below for different levels to join as a sponsor. Support for The Los Angeles Forum for Architecture and Urban Design and the Los Angeles Urban Rangers has been provided by the Metabolic Studio, a direct charitable activity of the Annenberg Foundation. Join now and help us continue an important dialogue about architecture, design, and Los Angeles. Round off 2018 with a cocktail (or two) and meet our LA Forum community. The LA Forum’s activities are organized by an all-volunteer board of directors, and we accept additional volunteers to assist with lectures, exhibitions and other events. Working with the Forum exposes volunteers to our broad range of programming as well as to our network of board members, who are active in the professional and academic fields of architecture, urban design, art, and other design and related fields. Participation is rewarded with volunteer memberships and/or free admission to some paid events, depending on amount of time contributed. The John Chase Memorial Fund (JCMF) is given in memory of urban designer, critic, and former board member John Chase. A grant is awarded a project inspired by the urban issues he believed in and aims to highlight new critical voices that contribute to contemporary urban thinking in Los Angeles in a unique and personal way. We are thrilled to keep the celebration of John alive with this endeavor. John Chase (May 21, 1953 – August 13, 2010) was a fixture in the Los Angeles design community for decades and the LA Forum is indebted to his vast contributions, both as a board member and as a critic of the public realm. John was a walking man committed to recognizing accidental public spaces and improving the built environment. He was a stylish blithe spirit, instigating serious debate while making us laugh. 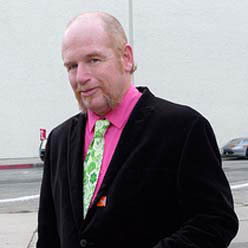 The Urban Designer for the City of West Hollywood for 14 years, Chase was a Board Member of the LA Forum from 1990-95. He was the co-editor of one of the LA Forum’s most significant publications, Everyday Urbanism, and wrote essays for Experimental Architecture in Los Angeles as well as articles for other Forum publications and the Forum Newsletter. In 2010, he contributed to the Forum’s Dingbat 2.0 Competition as a member of the jury, a participant in the panel discussions, and a source of substantial knowledge and energetic support throughout the entire project. A noted author on the subject of Southern California vernacular architecture, he repeatedly expressed his delight and gratitude at seeing the renewed attention paid to a subject he loved so much. With John Beach he wrote one of the definitive articles on dingbat apartment buildings in ‘The Stucco Box’, the first essay of his book Glitter Stucco and Dumpster Diving.